When you have bad credit, the last thing you want is another credit card. A secured visa credit card can actually help you rebuild credit, let’s take a look at how this card differs from a regular, or unsecured, credit card. Secured Card vs. 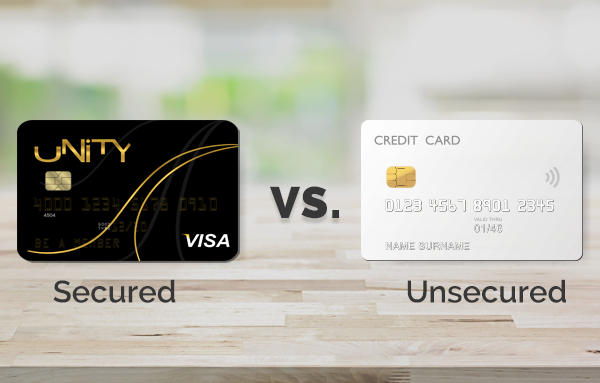 Unsecured Card – What’s the Difference? A secured credit card like the UNITY Visa Secured Card is a credit card that is funded by you. The amount you deposit for the card determines your limit. On the other hand, an unsecured card does not require you to fund it. Your credit limit for these cards is based on factors like your credit score and credit history and is determined by your lender. If you continue to demonstrate good credit usage, your lender may decide to raise your credit limit. Another big difference between the two is that secured cards are usually easier to get. They are known as second chance cards for a reason. An unsecured credit card, on the other hand, typically requires the applicant to have a decent credit score. To qualify for a card that comes with perks, you may need a good to excellent credit score. While both cards have their own merits, a secured card is the way to go if you have money management issues or are trying to rebuild credit. Using a secured card can help you live within your means and avoid falling deep into debt when trying to rebuild your credit. It can strengthen your credit score by helping you use credit wisely, and it’s a great card to start off with when you’re first learning to use credit. When you have bad credit, unsecured cards may carry high fees or come with high interest rates, and neither option is good for someone trying to rebuild credit. Charge in small amounts. It’s easy to keep a low limit since you’re funding the card, but it’s also wise to charge only what you can afford and pay off the entire balance. Keep your credit use low. If you do carry over a balance, keep the balance-to-limit ratio low. Pay your bill on time, every time. Doing so shows good money and credit management and will help raise your credit score. If you’re as serious about rebuilding credit as we are, we recommend applying for a UNITY Visa Secured Card. It comes with a fixed rate, access to our How to Rebuild Credit Program and reporting to the major credit bureaus, so you can see your efforts paying off when your credit score starts rising. You may think avoiding another credit card is the best thing to do when you want to rebuild credit, but that’s not always the case. Consider opening a secured credit card. If you place limited funds on it, use it sparingly and pay it in full each month, this credit card can easily help you rebuild your credit. I would like to apply for a unsecured credit card. I am disappointed you do not offer business funding or unsecured credit cards - By only offering secure cards you imply that all persons of color do not have good credit - I have a 700 FICO on all 3 bureaus so your secure card would not be of interest to me. I am also own a business - You offer me business checking but no other financial benefits that could help me expand my business or establish jobs for my community. Hi Ashley, thanks for reaching out. We are sorry that you are disappointed. The Unity Visa Secured Card is designed to help build or rebuild credit for those with no credit or those with challenged credit. It is our intention to help our community rebuild their credit for a stronger financially secure future. OneUnited Bank is designated by the U.S. Treasury as a Community Development Financial Institution or CDFI, which means our primary mission is community development. The majority of our lending goes to low-to-moderate income communities that are over 80% Black and Hispanic. We support non-profits who are focused on economic empowerment and social justice including the Urban League, NAACP, Black Lives Matter, etc. 100% of deposits to OneUnited Bank are used for lending (rather than investments). Our lending supports affordable multifamily housing, home ownership, first time homebuyers, community land trust homes and commercial real estate in Boston, Miami and Los Angeles. We do not currently offer business loans at this time because we offered them previously and experienced high losses. However we continue to explore opportunities to partner with organizations to support businesses. We are always looking to improve, so any suggestions are helpful. I have a few more questions can you help me? Thank you for this information. I would like to take advantage of the offer to rebuild my credit, however if I apply for the secured card, what are my chances of receiving the card; since my credit score is low at this time? Hi Casena, we are excited to hear that you are interested in the UNITY Visa Secured Card. A secured credit card looks and acts like any other credit card which requires a credit application. A secured credit card reports to the 3 major credit bureaus. Would like to read more on the advantages of banking with ONE UNITED instead of other banks/credit unions. Dear OneUnited Bank,I was totally unaware that you even existed until about an hour ago-and quite frankly,I feel somewhat bothered by that.You see,I have always advocated the importance of banking,building and buying black,yet I never heard of(according to you)the biggest black owned bank in the country!I'm 50 yrs.of age and am beside myself with this new founded information.I definitely would like to join.However,can you please send me more information on your services,interest rates,etc?I'm in the Baltimore,Marland area.My mailing address is Mr.Otis Smithson,P.O.Box 25648,Baltimore,Md.21224.My email address is:Osdiyn@gmail.com.I am trusting that this site is secure because I am really not comfortable with this online method of doing thingsHey,I'm old school....what can I say?Why don't you guys have locations here in the Maryland areas,particularly Baltimore?I work hard for my money and I'd like my money to work hard & smart for me!I also want to invest,as well as establish accounts for my children.please feel free to reach out to me.I look forward to hearing from you soon.Have a great evening. I would like more information on the secured cards please. I WAS interested in applying for a secured card, but when I called to ask if it was a hard pull or soft pull, the first representative didn't know what I meant and the second representative said legally they couldn't disclose that information to me (confused face). Is there anyone competent enough to answer simple questions at customer service? I'm really trying to "join the movement", but talking to your representatives just now is making it VERY hard for me to switch over. Hi Coy. We are sorry to hear this, and would like to help make things right. Our customer support team will look into this and be in touch to assist you soon. Coy Evans point is vital to gain new customers like me. The last bank that told me they would do a “soft pull”, instead did the usual “hard pull” and it showed up as a double inquiry and hard at that. Hi James, good question. Currently we do not offer unsecured cards at this time. The security deposit is refunded when the account is closed and paid in full. Hi Linda. Check out our UNITY Visa Secured Card at www.UnityVisa.com! Very interesting and long over due, I am definitely considering after further review of polices and which card would work best for me. Blessings and much continued success. Great question! Cards are received in 7-10 business days from the day your account is opened with us. What are my chances of receiving a card if my score is in the 500 range? I'm definitely interested! I. AM. Interested. In. Joining! Last year I contacted Swiss America for information on how to invest in precious metals--Gold and Silver. I was inquiring for someone else. They sent a packet of information, but I did not feel qualified to interpret the information that was sent and told the individual who asked me to inquire just that.With that said, can an individual invest precious metals with your bank? For someone who knows nothing about the Stock Market, investing in gold, silver, foreign currency,etc. and would like to learn, how would you advise them as to the protocol?I have already decided to open an account that will take One United because of your mission. When I heard the Owner's story about the officer who treated her with such disrespect is what convinced me that this bank was indeed Black owned as I had been searching for a "Black Own" bank, but up to now believed that the ones I have been investigated are truly Black owned. They have the face of bein Black owned, but really are not. Also, the various programs that you have begun to launch in the Black communities such as teaching Financial Literacy to our people is indeed one of the things we need in order to help change the mindset that so many of us have. Kudos to you One United Bank. Seems like a good debit creditcard. I have a secured visa card I want to increase my credit limit on the card. They say its on the website I can't find it can someone help me out thanks in advance. Hello. Please give our customer support team a call at 1-877-663-8648 for assistance. I live in Raleigh NC can you help me? Thanks for reaching out to us Michael. We currently do not have any branches in your area, but you can still bank with us using our online banking products. We offer everything from checking and savings accounts to secured credit cards and even certificates of deposit. Looking forward to starting this journey of building my credit up with this secured card I put a order in for! Just completed all the steps and just waiting to get approved in getting my card! I have had a card now for quite some time and wish to raise my credit limit. I have called and searched your website, but nobody seems to know how to do this ?? ?Also, why do you all HOLD Electronic Payments from Major Banks for 5 days, as well as payments made from your own bank?? I would definitely understand why you might place a HOLD on a personal check or even an unknown bank check but why the aforementioned?Thank you in advance. Hi Perry. Thank you for your comments. We are going to have a member of our customer support team reach out to assist you with this. I Love the design of the Amir debit card is that design available for the secured credit card. Hi David. Thank you so much! At this time, this is not a design option for our UNITY Visa Secured Card. Hi, I took the time to read more about one United, and I am inspired to share with my friends & associates the good news! I am a home owner with a fairly good credit score of 716, and looking to build excellent or A-1 credit, to do business in my community in new jersey; can you advise me on the fastest way to get excellent credit? and business loans? I Thank you in advance respectfully! Hi Chris. Have you checked out our How to Rebuild Credit Program on our website? You can find it here: https://www.oneunited.com/unity-visa/how-to-rebuild-credit-program/As far as business loans go, we currently do not provide loans that are not real estate secured. How do I activate my card? Or does it come activated? Hi Garrett. Please give our customer support team a call for assistance with this. They can be reached at 1-877-663-8648. I have a large group (1000+) that need debit cards on a closed loop system. A few thousand accounts right away. Can you help me? Hi Arthur. Please give our customer support team a call at 1-877-663-8648 so we can learn more about this and assist you. Hi Will you offer an insecure credit cars any time soon? Hi Karen. We offer a secured credit card to help rebuild credit because other institutions are promoting prepaid cards which charge high fees and do not rebuild credit. Our community was not being served so we stepped in to fill the gap. We do not have the economies of scale or size to offer an unsecured credit card at this time. Hope this is helpful. Dear OneUnited Bank, Thank you for the in-depth information on your website and offering both secured and unsecured credit products (In addition to your other offerings). I like the message and information you provide about your products. More financial institutions should follow your lead. Hats off to all of you at One United Bank! i currently have a secured card with you guys. i was wondering whats the process of transferring from a secured on a unsecured credit card. Can i use the same card? Hi Rashad,Great question, at this time we only offer the UNITY Visa Secured card. We do not have unsecured credit cards at this time. What builds credit faster, secured or unsecured? My wife put me on her acount as an authorized user, will my credit score increase at the same rate as hers or will there be a difference? Let's assume that the ratio is right, payments good and what not. I am unsure as to how this works actually. I thought it was a good idea but no one seems to be able to give me a accurate response. I got your card. A 250 balance. I paid my first bill infact paid more than what was due. do I have to apply more money to use the card? Opening an account with One United is a birthday gift to myself to ensure I keep my resolution to take necessary steps daily in rebuilding my credit and making a sound financial plan for my family. Thanks for reaching out Tristan. Our bank was started and to this day continues to be owned by Black people. Our CEO and Chairman, our President and COO, and the majority of our Board of Directors are black. We take great pride in being one of only 21 Black-owned banks in the nation. We hope these answers have been helpful, and you can also read about our management team here: https://www.oneunited.com/about-us/company-profile/management/. You can also read about our board of directors here: https://www.oneunited.com/about-us/company-profile/board-of-directors/. if I apply and get approved. can I add funds periodically to increase my limit or whatever I deposit at first is all I get? millietrobinson@hotmail.com. Before applying Is there a way to get a general Id on the interest rate on an unsecure card and the credit limit that I would be eligible for? What I am looking for is to get the two credit cards I have under one card. My credit limit is in the 700's. Hi Deon, great question. Every application is different as every person who applies is different. As soon as your application is submitted you will receive communications through email letting you know your progress. You can also speak to our Contact Center at any time if you need details about the application process. Very interesting it in the bank and everything that it offfers.